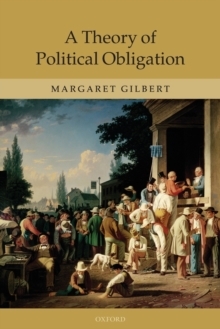 Margaret Gilbert offers an incisive new approach to a classic problem of political philosophy: when and why should I do what the laws of my country tell me to do? Beginning with carefully argued accounts of social groups in general and political societies in particular, the author argues that in central, standard senses of the relevant terms membership in a political society in and of itself obligates one to support that society's political institutions. Theobligations in question are not moral requirements derived from general moral principles, as is often supposed, but a matter of one's participation in a special kind of commitment: joint commitment. An agreement is sufficient but not necessary to generate such a commitment. Gilbert uses the phrase 'pluralsubject' to refer to all of those who are jointly committed in some way. She therefore labels the theory offered in this book the plural subject theory of political obligation. The author concentrates on the exposition of this theory, carefully explaining how and in what sense joint commitments obligate. She also explores a classic theory of political obligation -- actual contract theory -- according to which one is obligated to conform to the laws of one's country because one agreed to do so. She offers a new interpretation of this theory in light of a theory of plural subject theory of agreements. She argues that actual contract theory has more merit than has beenthought, though the more general plural subject theory is to be preferred. She compares and contrasts plural subject theory with identification theory, relationship theory, and the theory of fair play. She brings it to bear on some classic situations of crisis, and, in the concluding chapter,suggests a number of avenues for related empirical and moral inquiry. Clearly and compellingly written, A Theory of Political Obligation will be essential reading for political philosophers and theorists.